Arrival by train in Saverne. Visit of Chocolaterie Jacques Bockel in Monswiller. Transfer to Strasbourg. Guided tour in the city center, visit of the Cathedral and its astronomical clock. Diner at Maison Kammerzell and overnight in hotel. Sightseeing tour of Strasbourg in a boat (Batorama), look at the European Institutions and in the Petite France, look at the former Schaal Factory. Visit of the Museum Les Secrets du Chocolat. 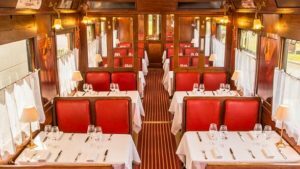 Chocolate lunch at restaurant Les Secrets des Grands Express in Geispolsheim in a former Orient Express train in the same place. Go to Gertwiller and visit the Pain d’épices Fortwenger Museum. Have a break in Coco LM or Patisserie Gross in Obernai and wine tasting. Overnight in hotel in Obernai or unusual accommodation in Klingenthal, around Obernai. From Obernai, go to Haut Koenisgbourg Castel for a guided visit. Typical lunch time in Ribeauvillé. Visit of Ribeauvillé old town. Visit of the Chocolaterie du Vignoble Daniel Stoffel. Transfer to Colmar and overnight. Visit of Museum Unterlinden. Lunch and visit of Colmar old city. Chocolate diner in restaurant La Palette in Wettolsheim. Overnight in La Palette or in an unusual accommodation not far from Colmar (Mitzach). Visit and tasting of Chocolaterie Bruntz in Kingersheim. Lunch time. Transfer to Euroairport Basel and departure.